We are within the context of one of the most interesting end-of-year exhibitions that benefited from the eye of an experienced and dedicated curator – it must be admitted that artists are in 99% of the cases better curators than critics – Assistant Professor Lisandru Neamțu from the chair of monumental art. Besides, in this exhibition, the Faculty of Decorative Arts and Design, section of monumental art, is present with a couple of tops, such as Lavinia Elena Vieru – whose concerns span from vast parietal projects with an energetic, gracious and decorative duct to interesting proposals of integrating an artistic approach in the tube of Bucharest or Cristina Stan – with a pavement for swimming-pools that is excellently solved in chromatic and formal view. Also here should be mentioned the formidable portraits (seeming to evoke by vastness the gigantic portrait of the Roman emperor Diocletian from Split), all coming out to light by an energetic sign and Kunstwollen of Iustina Sîrbu. 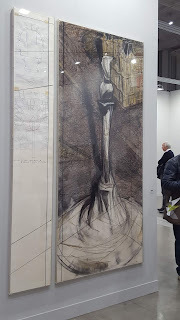 Also from the monumental art is the painting triptych evoking metaphysical painting, signed by Andrei Mușat, “Empty Throne”. We are thus at an exhibition of decorative arts, scenography and design and we note that in classical view, decorative arts seek beauty, pleasantness, formal perfection, often leaving the meaning to what the old history of art noted as “major arts”: painting, sculpture, architecture...But in modern art, such old classifications are often no longer operable and for example in the field of scenography, the meaning, the plastically supported reflexive connotation should be always present. We shall note so the works of year I scenography coordinated by Associated Professor Anca Albani and Associated Professor Roxana Ionescu, i.e. a type of itinerant miniature theater, some small jolly toys with so many plastic valences, that they are ready to grow into an entire show made by Francesca Cioancă, Daniel Anghelescu, Iulia Teuțan, Corina Șerbăneci, Cătălina Păun, then the work of Oana Letiția Grigore (master) and those of Ioana Nestorescu (year II), the latter awarded a prize at one of the most important scenography contests countrywide, organized by the prestigious Löwendal Foundation. At the textile section, the works of Amina Burloiu compose images of a visual freshness and a remarkable originality, of a conception intensity and inventiveness helping also us, the viewers, to instantaneously move away from our inferiority feelings of cultural province (we have to mention that there is an artistic elite of Romania in spite of a the absence of a connoisseur, motivating public) and places us in the core of high-quality international art, Amina Burloiu being among the seekers of meaning and message. A totally different approach is generated by the visual refinement of the strictly visual works signed by Teodora Chiroșcă – a cascade of light, of triangular geometric forms evoking the Viennese Secession and the beginnings of the Bauhaus, and in the same plastic approach are placed the white on white works of Cătălina Florescu and Alexandra Brândușoiu. Also at textiles we want to remind of the work of Corina Banciu, a project that is special in its turn by the complexity of the issues which the artist considered with talent and professionalism. Also pleasant to the eye are the compositional essays, the textile boards of Elena Raduț, Elena Popescu – supervising Professor Viorica Slădescu - Viorela Popa and Emma Topoliceanu. Dana Filipoiu intervenes in the exhibition with forms reminding of suprematism, the dynamics of cubic-futuristic shapes, for short of the avant-garde language, chromatically playing on the red/black/white/grey palette, whereas Cătălina Florescu – supervising Associated Professor Daniela Frumuşeanu – accomplishes a board where the very subtle boldness in a crescendo of elements is used as a compositional factor. Also under the supervision of the same professor were performed the compositions of vitalizing stains and signs Anca Higiu. In exchange, the board of Maria Popa with little peaceful circles, on primary colors and transparencies by overlaps of white express a relaxed serenity - supervising professor Claudia Mușat. Adina Dedu approaches in her decorative boards a chromatic in the tones of autumn, in abstract compositions, with a meditative purpose. Within the area of seeking meaning, we find absolutely remarkable works forged by Andrei Molnar, “Bug I” and II, where inventiveness, geniality (which we hope also to last beyond youth) and humor unite to create intense images, where quotations, technical insertions are as many historically and especially esthetically motivated flares. Whether it is an insect, an engine, it flies away and buzzes – Andrei Molnar shows to us a dynamic imminence, throwing the glove of the inertia of the soul to any viewer. Besides, the entire metal section was brilliant and we also remind here of a “Crane”, “Space Clock” and a “Dance” signed by Teodor Siminic, Alexandru Croitoru and Maria Stanescu, the majority of them dynamic compositions, as the balance studies which Laszlo Moholy Nagy used to make at Bauhaus, where each studies in plastic and emotional view the theme in his own original way. Also at the metal section supervised by Professor Bogdan Hojbotă, we remind of the work with the perfume of Brâncuși of Amelia Ghioală or the construction signed by Răzvan Botezatu. The graphic design is represented by one of the most valuable graduates of the recent years, Marina Berea, insatiably and with talent experimenting the options of the domain. Industrial design is excellently represented by Andrei Sandu where, the same as with some of the best, we note the complexity of the issues which the creators proposed themselves to solve. And because we talked about colorful graphic design, we should also refer to the alive chromatic universes, one in figurative, oneiric and narrative key of Ioana Duţă, the other abstract, in geometrizing key of Nicoleta Bercaru. A type of free geometrism, with a warm chromatics with red, grayish-yellowish and signs, X’es freely and joyfully configuring the trajectories of the compositions. It is something characteristic to the Romanian abstract painting in these works. Is there something from the warm geometrism of the ancient Romanian folk art, such from Blouse roumaine of Henri Matisse (art uncontaminated by the kitsch of the operetta folklore, which brutally replaced the decorative chastity with roses from a Russian carpet) in the essence of a painting? Ceramics has its remarkable representatives, with amazing creations in technical view (but which are undoubtedly also an aesthetic fulfillment), such as the tracery in porcelain spheres of Elena Mardare, the prudent and fine works like Rhapsody in Blue of Alex Bucur, a complex composition both in technical view and as a plastic idea called “Germination” of Georgiana Ion or the board with ceramic geometric elements, on natural tones, where the graphic structures evoke nature at a small scale, “Forest”, by Ioana Maria Stoica. We also noticed the classical vases, of an attractive, but an energetic formal elegance of Diana Butucariu, Miruna Coman and of Gheorghe Cristea (supervising Professor Cristina Bolborea). Among the very good graduates of the glass section we remind of Gabriela Velea with “Molecules” forming the strong, solar and seducing work of suspended pieces, fully of joie de vivre, of Ioana Stelea, with a romantic, poetic delicate facility, which seems to compose before our eyes the moment of writing a letter, which is full of hesitations and reflections (very beautiful also the compositional and ideational pendant, which it establishes as a dialog and element of fulfilling the space facility through the two white drawings on black background as X-rays of human creation). Not at all melancholic, full of humor seems the approach of Prundov Panteleymon, who exuberantly plays with glass shapes. Last but not least, we refer to the fashion section, where we notice some of the most interesting works, coming with something really new and applied to the domain, the work of Andreea Burloiu - supervising Professor Doina Lucanu – as an original spring season (actually no spring season is like the other and so said artists from Boticelli to Vivaldi and Pissaro), the spirit with the echo of an avant-garde manifesto in the work “Zip it!” of Gina Casapu and also the ironic exploration of the functions of the costume with a remarkable plasticity and force signed by Nicole Bergmann. Elegance as a subject and as a tour de force. Related to fashion appear also the very original air structures with an anthropomorphic destination created by Andreea Stancu (under the supervision of Professor Viorica Petrovici), scenography master, and the work of Camelia Raluca Radu. We conclude also with the section of mural art – with a proposal and an accomplishment. The first is a geometrical trompe l’oeil that would have the gift to wake the interest by its novelty, by leaving the expected languages, for the blind wall from Grivița and the second is maybe one of the best and most applied works of monumental art accomplished for the Faculty of Sociology, both conceptually and visually, signed by Anca Sîrbu and Ioana Iliescu respectively. This work for the Faculty of Sociology has the force to show with sympathy what may be and what should be a European society in the 19th century XXI. An important part of the makeover is to give the bed a new summer-inspired look. Staying with a more contemporary style ensures that your kid doesn't need to redecorate all the time. Good quality metal beds are also stronger, studier and more durable than wooden beds.